Even as a child my grandmother's maiden name of Druitt struck me as slightly amusing. It has a very Victorian London ring to it, and most of the Druitts I've found are in London. My grandmother was no exception to this, a real Cockney lady. 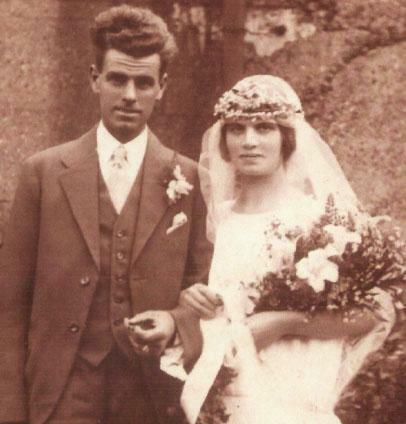 Jessie Dora Druitt (seen in her wedding photo, left) was a beauty, a slim redhead with wonderful green eyes. My daughter has taken after her dramatically in appearance, minus the red hair. Of course the most famous Druitt of all was Montague John Druitt , a key suspect in the Jack the Ripper investigations. Many believe he WAS the Ripper. Is he family? The resemblance is striking, but he came from a West Country professional family, not the London working classes. Still, there aren't MANY Druitts around, so I guess we're all related somewhere. Spooky. According to those folk who make the mass-produced family history scrolls Druitt is an Anglo-Saxon name originating in Oxfordshire. Obviously the spelling has changed, as it doesn't look very Anglo-Saxon to me. I always assumed it was Norman, it looks French. I've seen a variation - Drewitt - and I must assume they are variations of the same name. Witt is an Anglo-Saxon word meaning wise counsel, related to the German witten. Until I find John Druitt's parents I am collecting all the Druitts I can find. You may find these lists useful. Entries in italics are taken from the 1901 census, therefore the year of birth can be out. Please read How can the age be out by one year? Also, place of death for these entries is ASSUMED based on place of residence in 1901 census. More explanations of the quirks of census returns can be found in Harry Broadrick's FAQ. I strongly recommend this service if you have no other access to census records. OBVIOUSLY, older women named Druitt in 1901 were either spinsters or born with a different name. It must be considered that two people with the same name, and dates and places that "fit" could be the same person, but I'll leave that to you to decide.